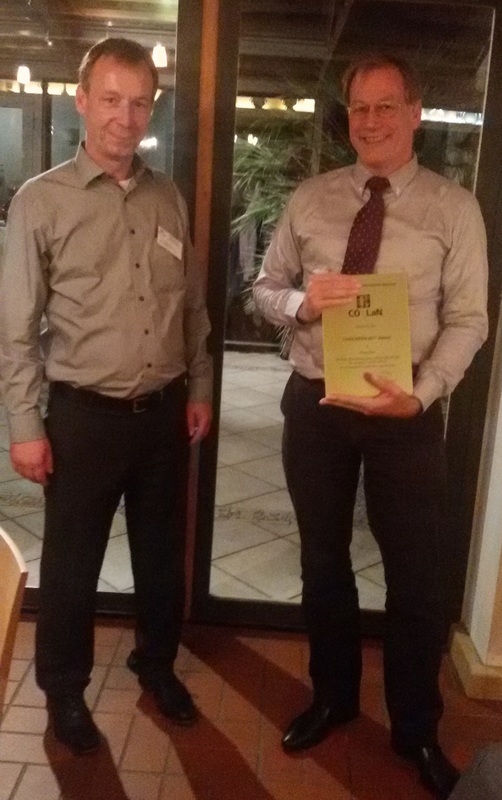 On October 9, 2018, Richard BAUR, representative of Shell acting as President of CO-LaN Management Board, presented Harry KOOIJMAN, as representative of the ChemSep development team at the CAPE-OPEN 2018 Annual Meeting, with the CAPE-OPEN 2017 Award for their pioneering and unflinching efforts to develop CAPE-OPEN to a successful business opportunity. ChemSep is a creation of Harry and Ross TAYLOR, Professor of Chemical Engineering at Clarkson University in Potsdam, New York; Ross was unable to attend the meeting in person. Richard BAUR pointed out the sustained and long-lasting involvement of ChemSep with CAPE-OPEN, starting with the presentation of the first version of ChemSep as a CAPE-OPEN Unit Operation at the 2nd CAPE-OPEN European Conference back in February 2005. At that time ChemSep felt the need to develop the use of the ChemSep distillation column simulator especially in the industry, and wrapping ChemSep as a CAPE-OPEN Unit Operation appeared as the way to go. ChemSep Unit Operation evolved over time with a support for the version 1.1 of the Thermodynamics and Physical Properties interface specification together with more modelling features. ChemSep also developed a CAPE-OPEN Property Package which, to the surprise of the ChemSep authors, is rather often used according to the respondents to the CAPE-OPEN survey. This Property Package was wrapped as a CAPE-OPEN Process Modelling Component through the Consultancy Service Scheme awarded to ChemSep by CO-LaN back in 2013. In his acceptance speech Harry KOOIJMAN thanked CO-LaN for the Award. He acknowledged the many years of financial support by BP and other industrial sponsors that has made ChemSep what it is now. Congratulations to Harry, Ross and ChemSep! On March 8, 2007 CO-LaN President Ray Dickinson presented the 2006 CAPE-OPEN Award to Jasper van Baten….